As the issue of ethics heats up in the Alaska Senate race, the Alaska Democratic Party (ADP) today called for full disclosure of donation and expenditures for the Ted Stevens Foundation. 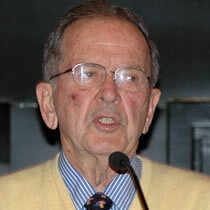 The Ted Stevens Foundation was founded in 2000 with its first event consisting of a fundraiser with lobbyists in 2004. As of 2005, the foundation's net assets reached $2.3 million. Today, the ADP charged that the Stevens Foundation uses an ethics loophole allowing those who donate to seek favors from Congress. "Alaskan families have been kept in the dark, and they deserve full disclosure from their public officials," said Bethany Lesser, spokeswoman for the ADP. "The Ted Stevens Foundation could be a wonderful charity or a Congressional pay-to-play loophole. With the lack of disclosure, who knows? Senator Stevens is currently under investigation, and it is not unreasonable that he disclose who has given to the foundation, how much they have given, and how the money has been spent." The Ted Stevens Foundation changed its name in December 2006 to the North to the Future Foundation. Only financial statements from 2003 - 2005 have been available. Alaska fishermen shout at Ted Stevens in Kodiak. Stevens later lied to a reporter and denied the incident occurred.